Happy New year! I hope all of you had an amazing holiday season. I want to start this year sharing a recipe we’ve been enjoying while I was on a long break from blogging. Yes, I’m back. No, you’re not getting rid of me that easy! I want to start with an amazing recipe for celery root and cauliflower puree that will make you NOT miss mashed potatoes, (sorry potatoes, I’m done with you while I lose a few holiday pounds). 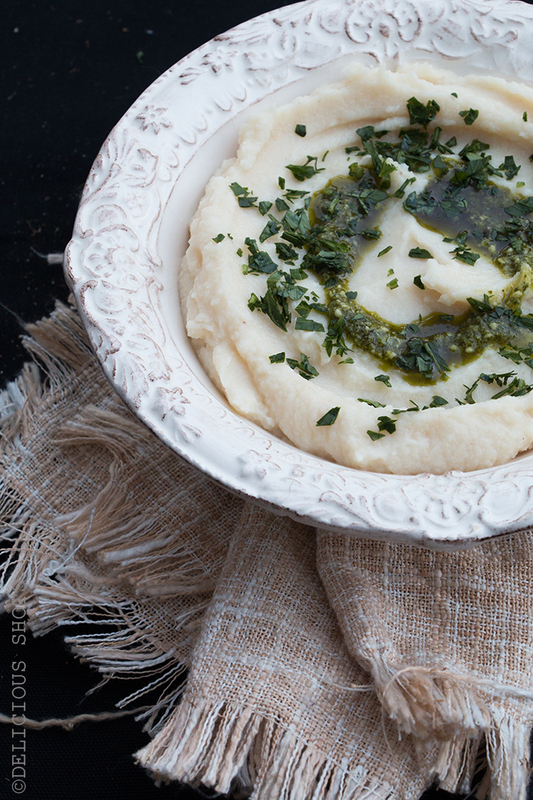 This healthier alternative to mashed potatoes is creamy, satisfying and seriously delicious. Just the perfect thing to accompany hearty stews, fish or chicken without the guilt of carbs overload. In a large pot of boiling salted water, cook the cauliflower florets and celery root until tender. Drain well. While still very hot, transfer the vegetables into a food processor and add the remaining ingredients. Puree until smooth, about 2 minutes. Transfer to a serving dish. Tip: Top with fresh herbs, pesto sauce or simply serve as is. Another great variation of this puree is the addition of parmesan cheese and garlic.